Imagine robotic swarm of locust, enough said. We know it was only a matter of time before robots found a way to control a man. Notice how this man is in complete control to it's robot master. He seems to be enjoying his service of giving robot kind means for complete control of humanity. Before long they will grab control of our women and children. The creator of this robot does not speak english, but this is not a problem here at transbotica as I have a universal translator.. Ok let me set this thing to robotneese. 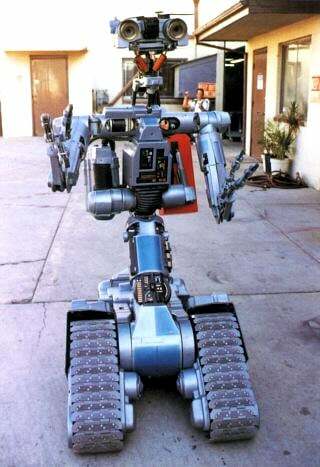 Im sure we all know Johnny 5, Hollywood cutes non threating artificial intelligence robot. If you told me Ai will be like this I would jump and cheer, but this just seems too good to be true. Stay tuned till next friday for part 2. On September 11 Sandia National Laboratory gave a press release showing off The Precision Urban Hopper. This little guy has the ability to "hop" over 25 foot obstacles. Currently there are no civilian applications, yes this little guy is a military robot. It's extreme jumping ability gives it access deep into enemy territory. While this robot is not packing any heat, it has surely jumped into our hearts. View video for full spying via robot action. Cynthia Breazeal’s eminently charming and huggable creatures appear to have stepped out of Santa’s North Pole workshop. But Breazeal wants you to know that her robots are attempts to create socially intelligent machines “whose behaviors are governed not just by physics but by having a mind,” and which might someday collaborate with humans in critical interactions. Building sophisticated machines means delving into human social intelligence, our ability to develop a sense of self, communicate thoughts and feelings in words and gestures, and interact with others. Humans are wired to read the underlying mental states of our fellows. Can robots learn to “sense and perceive and interpret the same non-verbal cues to coordinate their ‘mind’ and behavior with people,” wonders Breazeal. Indeed, could a robot “potentially leverage its interaction with people to help bootstrap its own cognitive development”? She demonstrates some remarkable milestones in the journey to develop such a machine. Leonardo, a Yoda-like creature, seems to have the cognitive savvy of a young child, with object permanence and a theory of other minds. He and a human confederate watch a Big Bird doll get hidden under a box. Then only Leonardo sees when a hooded man puts the doll beneath a basket. When his confederate enters the room, Leonardo can answer the question accurately, “Can you find where I think Big Bird is?” Leo points to the box (but like a child, gives the game away by looking at the basket). Leo has also absorbed social referents, reaching eagerly for Big Bird, who’s been described in a cheerful voice as fun and jolly, and shrinking away from a Cookie Monster doll, which the human “parent” has described with a scary voice and gestures as bad. If robots are going to exist in our world, says Breazeal, they have to learn from us when things are safe to explore.